Liquid seaweed fertilizer is a mild, non-burning form of seaweed. The low numbers in the N-P-K ratio are a clue that you can use it every time (as directed) without damage to your plants. Add 10 ml to every gallon of water you give to your plants. Liquid seaweed also makes a great foliar spray. Mix it according to directions, and mist your plants with it every 3 or 4 days. The solution requires no Ph correction, and plants treated in this way will never develop a micro-nutrient deficiency...not to mention the faster growth rates. Kelp meal is another mild form of seaweed fertilizer with a very low N-P-K ratio. Added to the soil mix, it will not burn your plants and provides an excellent source of carbohydrates, which in turn support large populations of beneficial micro-organisms. The important role of these micro-organisms should not be overlooked. In addition, it is an excellent source of fully chelated micro-nutrients and plant hormones (like all seaweed products). With such low N-P-K numbers, seaweed fertilizers are often used as supplements, instead of as the main fertilizer. All purpose fertilizers simply take a seaweed base, like kelp meal, and process it to include an N-P-K ratio with higher numbers. An all purpose, seaweed fertilizer such as Maxsea has one basic formula for the vegetative stage (16-16-16) and one for the flowering stage (3-20-20). Fertilizers with higher N-P-K numbers are more capable of burning your plants. Carefully read and follow the directions. If you are feeding your plants each time you water, use only half strength nutrient solution. The safest way is to always measure the nutrient solution strength with a TDS meter or EC meter before using it on your plants. One of the biggest benefits of using Maxsea is that it is very close to the ideal nutrient solution pH, and it's pH tends to drift upwards very little when sitting in a nutrient reservoir over time. Controlling the pH of the nutrient solution is extremely important to the success of a hydroponic garden, and probably causes the greatest number of problems for the indoor gardener as far as plant nutrition is concerned. For anyone beginning a hydroponic garden on a tight budget, using Maxsea is one way to avoid having to purchase an expensive pH meter (at first) while still being able to achieve very good results. If you decide to use Maxsea, be sure to add 1 teaspoon of Epsom salt to every gallon of nutrient solution. 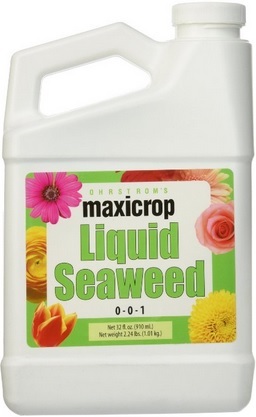 This provides your plants with Magnesium, which is the only micro-nutrient lacking in the Maxsea fertilizers. Even better, use Maxsea in combination with Cal-Mag supplement. This will give you a very complete and very affordable feeding strategy that is also very easy to maintain. One of the only places you will be able to find Maxsea fertilizer is Charley's Greenhouse and Garden. When using the above seaweed fertilizers, I have never found it necessary to use a concentrated supplement. Concentrated supplements are for plant hormones more than for micro-nutrients or carbohydrates. I suggest you learn about pH, temperature, light, humidity, CO2, Oxygen, and the basic N-P-K ratios before trying to boost your plant growth with concentrated plant hormones. If you feel you have the years of experience needed, and you are finely tuned to your indoor plants, and you still feel you need a little boost in the plant hormone department, than I suggest Nitrozime seaweed extract.